Entering the ring at the RMG just in time for the Toronto 2015 Pan Am/Parapan Am Games is an exhibit that is sure to be a knockout. Boxing is a metaphor for life, filled with battles lost and won. In Boxing: The Sweet Science, curator Linda Jansma captures this expression through pieces that convey the movement, power and elegancy of the sport. Oshawa named as the host of the boxing events for the Pan Am Games served as the catalyst for the exhibit based around the sport commonly referred to as The Sweet Science (a term coined by the British journalist and sportswriter Pierce Egan in the early 1800s). The city has a rich history in the sport as home to three-time Canadian featherweight champion Grant O’Reilly who operated two boxing clubs here in Oshawa. The dramatic nature of this heavy-hitting sport has ignited a passion among artists throughout history, dating back to the Mesopotamian era that includes literature, art and drama. A knowledge as vast as the Rocky series is not need in order to appreciate the works in Boxing: The Sweet Science. The exhibit features 12 artists whose works, spanning over 100 years, align with the centralized theme of the art and spirit of boxing. In British photographer Eadweard Muybridge’s work Boxing, open hand printed in November 1887, the physical intensity and athleticism of boxing is captured in 16 separate frames. While this piece is more of a literal interpretation of the sport, John J. A. Murphy’s Shadowboxing, 1924 adorns an abstract vision of boxing. In addition to history works, Boxing: The Sweet Science features contemporary pieces that capture the essence of the sport. 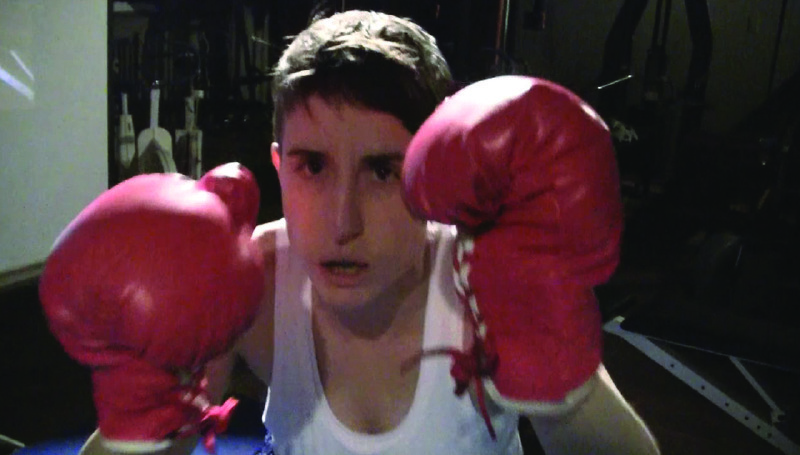 In Stop Beating Yourself Up, Montreal-based performance artist Coral Short addresses the stigma that boxing is a man’s game. For the video, created in 2013, Short is donned in a boxer’s uniform while beating herself unconscious using “semi-believable” moves she learned while training with boxers. The graphic nature of this video is hard to watch but contains a message with a powerful punch. Similar to Short, Toronto photographer Pete Doherty uses boxing as a way to depict the war inside the artist. A part of the boxing scene for several decades now, the sport and its community helped lift Doherty out of years of depression. 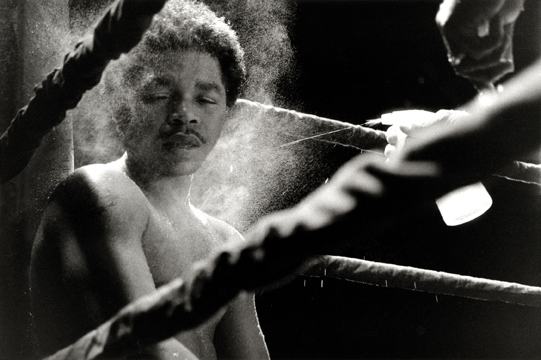 He began to photograph what he was experiencing as both the artist and the subject, giving viewers a look on the inside of boxing. The black-and-white photographs in Boxing: The Sweet Science depict a ringside and in the ring view including images of trainers and boxers alike, capturing the key moments of the sport. Pete Doherty, The Docks Nightclub, Toronto, Ontario, Gelatin Silver Print, 2005. Photo credit: Pete Doherty. Whether it is as an exercising method in World War I as depicted in an anonymous photograph or cubist depictions of pugilists, boxing depicts the exterior and interior battle we fight as humans. 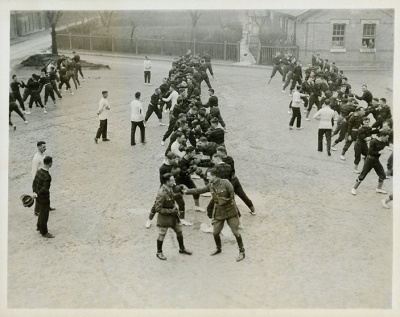 Anonymous, Boxing competition at Shorncliffe, Brigadier-General MacDonald, D.S.O. and Lieutenant-Colonel Mayes, inspecting classes, April 1918. Photograph. Boxing: The Sweet Science is on from May 30 to September 13 with an opening at RMG Fridays, June 5 at 7-10 pm and a Talk and Tour on Sunday, June 28 at 1-3 pm. Vol ‘n’ Tell is an ongoing series of blog posts written by RMG Volunteers. Raechel Bonomo is an art enthusiast and writer from Oshawa, Ont. Image at top: George Bellows, American (1882-1925), The White Hope (detail), 1921, Lithograph on paper, 48.5 x 60.8 cm, Collection of the Art Gallery of Hamilton; gift of Mr. and Mrs. J.A. McCuaig, 1965, Photo credit: Michael Lalich.